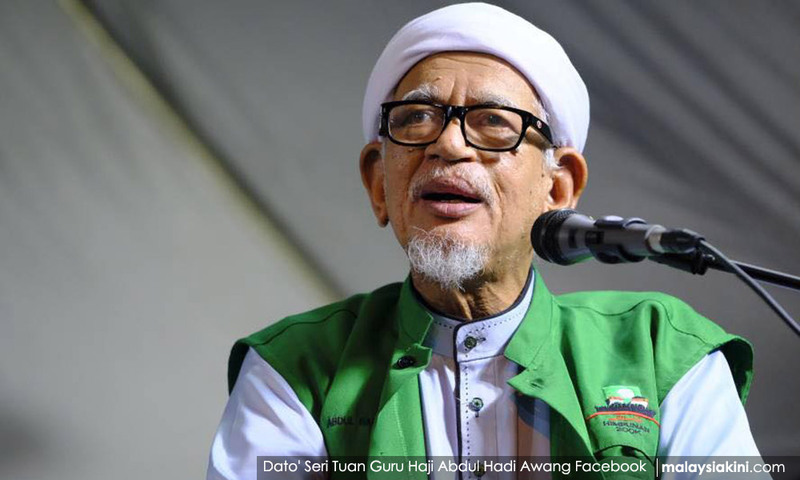 COMMENT | The problem many people make with PAS is that they conflate Abdul Hadi Awang and the Islamic struggle of PAS. While PAS may have lost supporters because of Hadi’s perceived collusion with Umno, the reality is that PAS is the only political party with a coherent political and religious ideology and vision for Malaysia that makes them, for now, political outsiders albeit with considerable influence when it comes to the weakened mainstream Malay/Muslim hegemons. While Hadi is a hate figure for opposition – now establishment – types, the reality is while PAS may not have hindered the current Pakatan Harapan regime in the recently concluded general elections, its GE14 outcome is testament to the fact that Hadi’s leadership of PAS has sustained the party through a Malaysian tsunami while creating a tsunami of their own. PAS has remained true to its principles, and in numerous articles that mainstream English speakers can’t be bothered to read told their supporters that winning the federal government at the expense of their Islamic values is not something which PAS desires. What they want is a Malay/Muslim tsunami which legitimately leads them to federal power or to create coalitions with like-minded political hegemons which sees their power-sharing, which does include them betraying their Islamic values. PAS’ green tsunami is honourable because despite the narrative of partisans of PAS being betrayers and spoilers for Umno, PAS supporters and the leadership were steadfast in their own narratives about a kleptocratic government, the high cost of living and the values of Islam in a Malaysia which was compromised. Now while Hadi was cosying up to Umno which disgusted some, the base although conflicted, understood that Malay/Muslim solidarity was important on certain issues, especially after the perceived betrayal by Amanah and DAP. Does this mean that when it comes to politics, PAS does not fight dirty? Of course not. In some cases, they fight dirtier. This merely means that PAS is not stupid, which is how some characterise them. This means that like most successful Islamic hegemons operating in “moderate” political terrains, PAS understands the need for the carrot-and-stick approach. In case people were wondering, the carrot approach was when they were in Pakatan Rakyat. The stick approach got them Kelantan, Terengganu and great influence in Perak and Kedah. PAS retaining Kelantan which many pundits, politicians and opposition supporters claimed impossible, taking Terengganu which many thought inconceivable and becoming extremely influential in Perak and Kedah, is evidence that this Islamic party remains a contender in mainstream Malay/Muslim politics despite their outsider status. It would be foolish to continue to dismiss the PAS leadership or demonise their supporters.